My friend Ox came to visit. Ox is a lot older than me and quite grumpy, although Mom says he is sweet. I don’t see it – he bosses me around and growls at me when I try to take MY toys away from him … what’s “sweet” about that? But I love it when Ox comes to play or when we get to take long walks together with our people. Ox and Dexter playing Tag. This is a Flickr badge showing photos in a set called Dexter. Make your own badge here. 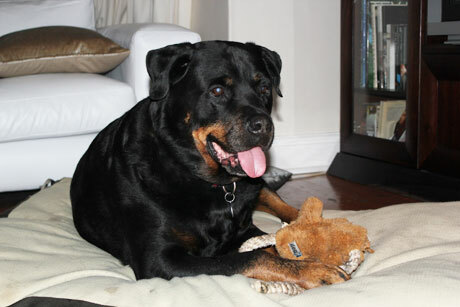 Dexter is a pure-bred Rottweiler. 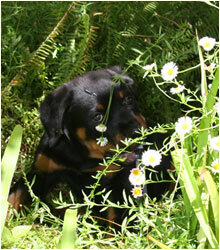 Dexters Blog, www.RaisingDexter.co.za is a blog that follows Dexters growth from puppy to full grown Rottweiler! 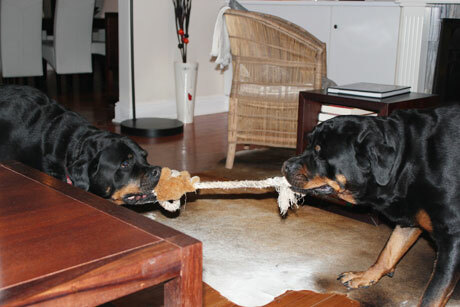 Dexter lives with his family in Cape Town, South Africa.